Please note! We're revising the course list for 2003. Expect to see all the courses back on Feb. 1! Welcome. My name is Nancy Conner; I have a Ph.D. from Brown University, and I have been teaching courses in composition and literature for more than 15 years. 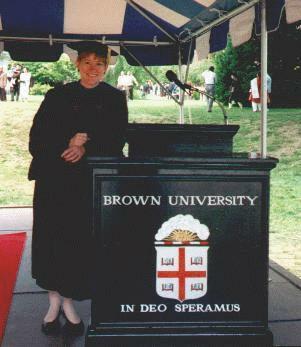 Besides Brown, I've taught at Auburn University, Fisher College, Endicott College, Merrimack College, and Phillips Academy Andover. My teaching interests include medieval literature, mystical discourse, cultural studies, poetry, and the on-line workshops listed farther down this page. Comp 101 Writing Workshops The other courses will be back Feb. 1! In addition to teaching, I am a freelance editor. If you are looking for assistance with developmental editing, copy editing, or proofreading, please e-mail me for my resume. I want to give a very heartfelt thank you to Nancy Conner, who has to be the world's greatest editor. Your editing style, attention to detail, and organization made it much easier to deal with writing this book than it would have been otherwise. Thank you for knowing how to go easy on my ego while still producing text that can be read by the rest of the world. Are your grammar and punctuation skills a bit rusty? Learn how to be your own editor in Comp 101! Just click what you'd like to review to get a guide. Watch this space! I'll be adding more grammar and punctuation guides soon! We're revising the workshops for 2003. Please check back in February. I offer a number of workshops that combine writing development with personal growth. Each workshop is free and will be conducted through an e-mail list and a bulletin board specific to the appropriate topic. Below are descriptions of each workshop. You can start at any time and proceed at your own pace. If you are interested in taking one of these workshops, e-mail me for more details or click the appropriate link. Most of us have a sense--however fleeting--of being a part of something more than the skin we walk around in or the thoughts we carry in our heads. This workshop will help you to explore and articulate your spirituality. Over eight weeks, you will write about your past and present spiritual selves, seeing where your own path began and where it has taken you. You do not need to belong to a particular religion to participate in this workshop. All you need is a desire to look into and share your story with others in an atmosphere of mutual respect and support. Revised workshop beginning February 2003! Whether or not we're aware of it, we all follow scripts "written" by our culture when we communicate. Have you ever answered "Fine" to the question "How are you?" --when you felt anything but fine? Has an argument ever maneuvered you into asserting a position you don't really hold? Do you sometimes notice that your writing just doesn't sound like you? This workshop aims to help you break away from culturally imposed scripts that can stand between you and your meaning. Using a number of simple techniques and exercises, you will learn how to take your voice from automatic to authentic. Click here to begin Writing Outside the Lines. This workshop is for those who would like to make their writing more concrete and tangible. Avoid unnecessary abstractions and present what you see, think, feel in palpable terms that engage the reader's senses. In this workshop, you'll start with short exercises to bring your writing into the here-and-now, gradually moving to longer, sustained descriptions and personal essays. Click here to begin Sensual Writing.